"Sishya" redirects here. For the 1997 film, see Sishya (film). The guru–shishya tradition, or parampara ("lineage"), denotes a succession of teachers and disciples in traditional Vedic culture and religions such as Hinduism, Jainism, Sikhism and Buddhism (Tibetan and Zen tradition). Each parampara belongs to a specific sampradaya, and may have own akharas and gurukulas. It is the tradition of spiritual relationship and mentoring where teachings are transmitted from a guru "teacher" (Sanskrit: गुरु) to a śiṣya "disciple" (Sanskrit: शिष्य) or chela. Such knowledge, whether it be Vedic, agamic, architectural, musical or spiritual, is imparted through the developing relationship between the guru and the disciple. It is considered that this relationship, based on the genuineness of the guru, and the respect which is not based on age or how old one looks, commitment, devotion and obedience of the student, is the best way for subtle or advanced knowledge to be conveyed. The student eventually masters the knowledge that the guru embodies. Guru–shishya means "succession from guru to disciple". Paramparā (Sanskrit: परम्परा, paramparā) literally means an uninterrupted row or series, order, succession, continuation, mediation, tradition. In the traditional residential form of education, the shishya remains with his or her guru as a family member and gets the education as a true learner. In the early oral traditions of the Upanishads, the guru–shishya relationship had evolved into a fundamental component of Hinduism. The term "Upanishad" derives from the Sanskrit words "upa" (near), "ni" (down) and "şad" (to sit) — so it means "sitting down near" a spiritual teacher to receive instruction. The relationship between Krishna and Arjuna in the Bhagavad Gita portion of the Mahabharata, and between Rama and Hanuman in the Ramayana, are examples. In the Upanishads, gurus and disciples appear in a variety of settings (e.g. a husband answering questions about immortality; a teenage boy being taught by Yama, Hinduism's Lord of Death). Sometimes the sages are women, and the instructions may be sought by kings. In the Vedas, the knowledge of Brahman (brahmavidya) is communicated from guru to shishya by oral lore. Ekalavya's dakshina of his right hand thumb to his guru. The establishment of a teacher/student relationship. A formal recognition of this relationship, generally in a structured initiation ceremony where the guru accepts the initiate as a shishya and also accepts responsibility for the spiritual well-being and progress of the new shishya. Sometimes this initiation process will include the conveying of specific esoteric wisdom and/or meditation techniques. Gurudakshina, where the shishya gives a gift to the guru as a token of gratitude, often the only monetary or otherwise fee that the student ever gives. Such tokens can be as simple as a piece of fruit or as serious as a thumb, as in the case of Ekalavya and his guru Dronacharya. In some traditions there is never more than one active master at the same time in the same guruparamaparya (lineage). Traditionally the word used for a succession of teachers and disciples in ancient Indian culture is parampara (paramparā in IAST). In the parampara system, knowledge (in any field) is believed to be passed down through successive generations. The Sanskrit word figuratively means "an uninterrupted series or succession". Sometimes defined as "the passing down of Vedic knowledge", it is believed to be always entrusted to the ācāryas. An established parampara is often called sampradāya, or school of thought. For example, in Vaishnavism a number of sampradayas are developed following a single teacher, or an acharya. While some argue for freedom of interpretation others maintain that "Although an ācārya speaks according to the time and circumstance in which he appears, he upholds the original conclusion, or siddhānta, of the Vedic literature." Akhara is a place of practice with facilities for boarding, lodging and training, both in the context of Indian martial artists or a Sampradaya monastery for religious renunciates. For example, in the context of the Dashanami Sampradaya sect, the word denotes both martial arts and religious monastic aspects of the trident wielding martial regiment of renunciate sadhus. The seeker must serve the guru and submit his questions with all humility so that doubt may be removed. (see Bhagavad Gita 4.34). According to Advaita, the seeker will be able to attain liberation from the cycle of births and deaths (moksha). The guru–shishya tradition plays an important part in the Shruti tradition of Vaidika dharma. The Hindus believe that the Vedas have been handed down through the ages from guru to shishya. The Vedas themselves prescribe for a young brahmachari to be sent to a Gurukul where the Guru (referred to also as acharya) teaches the pupil the Vedas and Vedangas. The pupil is also taught the Prayoga to perform yajnas. The term of stay varies (Manu Smriti says the term may be 12 years, 36 years or 48 years). After the stay at the Gurukul the brahmachari returns home after performing a ceremony called samavartana. The word Śrauta is derived from the word Śruti meaning that which is heard. The Śrauta tradition is a purely oral handing down of the Vedas, but many modern Vedic scholars make use of books as a teaching tool. The guru passes his knowledge to his disciples by virtue of the fact that his purified consciousness enters into the selves of his disciples and communicates its particular characteristic. In this process the disciple is made part of the spiritual family (kula) - a family which is not based on blood relations but on people of the same knowledge. Devotion to the guru as a divine figure or Avatar. The belief that such a guru has transmitted, or will impart moksha, diksha or shaktipat to the (successful) shishya. A relationship of lover and beloved known as bridal mysticism, in which the devotee is the bride and Siva the bridegroom. The assignment of all or many of the material possessions of the shishya to the guru. The strict and unconditional adherence by the shishya to all of the commands of the guru. 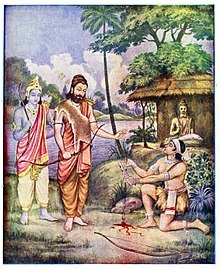 An example is the legend that Karna silently bore the pain of a wasp stinging his thigh so as not to disturb his guru Parashurama. A system of various titles of implied superiority or deification which the guru assumes, and often requires the shishya to use whenever addressing the guru. The requirement that the shishya engage in various forms of physical demonstrations of affection towards the guru, such as bowing, kissing the hands or feet of the guru, and sometimes agreeing to various physical punishments as may sometimes be ordered by the guru. Sometimes the authority of the guru will extend to all aspects of the shishya's life, including sexuality, livelihood, social life, etc. Often a guru will assert that he or she is capable of leading a shishya directly to the highest possible state of spirituality or consciousness, sometimes referred to within Hinduism as moksha. In the bhakti guru–shishya relationship the guru is often believed to have supernatural powers, leading to the deification of the guru. In the Pali Buddhist tradition,magae the Bhikkus are also known as Sekhas (SN XLVIII.53 Sekha Sutta). In the Theravada Buddhist tradition, the teacher is a valued and honoured mentor worthy of great respect and a source of inspiration on the path to Enlightenment. In the Tibetan tradition, however, the teacher is viewed as the very root of spiritual realization and the basis of the entire path. Without the teacher, it is asserted, there can be no experience or insight. The guru is seen as Buddha. In Tibetan texts, emphasis is placed upon praising the virtues of the guru. Tantric teachings include generating visualisations of the guru and making offerings praising the guru. The guru becomes known as the vajra (figuratively "diamond") guru, the one who is the source of initiation into the tantric deity. The disciple is asked to enter into a series of vows and commitments that ensure the maintenance of the spiritual link with the understanding that to break this link is a serious downfall. In Vajrayana (tantric Buddhism) as the guru is perceived as the way itself. The guru is not an individual who initiates a person, but the person's own Buddha-nature reflected in the personality of the guru. In return, the disciple is expected to show great devotion to his or her guru, who he or she regards as one who possesses the qualities of a Bodhisattva. A guru is regarded as one which has not only mastered the words of the tradition, but one that with which the student has an intense personal relationship; thus, devotion is seen as the proper attitude toward the guru. In giving this power over to someone else they have a certain hold and influence over us it is hard to resist, while we become enthralled or spellbound by the power of the archetype. ^ Monier Monier-Williams (1899). A Sanskrit-English Dictionary. Oxford: Oxford University Press. p. 587(column a). OL 6534982M. ^ Bg. 4.2 evaṁ paramparā-prāptam imaṁ rājarṣayo viduḥ - This supreme science was thus received through the chain of disciplic succession, and the saintly kings understood it in that way..
^ a b c Satsvarupa, dasa Goswami (1976). "Readings in Vedit Literature: The Tradition Speaks for Itself". S.l. : Assoc Publishing Group: 240 pages. ISBN 0-912776-88-9. ^ Akharas and Kumbh Mela What Is Hinduism? : Modern Adventures Into a Profound Global Faith, by Editors of Hinduism Today, Hinduism Today Magazine Editors. Published by Himalayan Academy Publications, 2007. ISBN 1-934145-00-9. 243-244. Neuman, Daniel M. (1990). The life of music in north India: the organization of an artistic tradition. Chicago: University of Chicago Press. ISBN 0-226-57516-0. Federico Squarcini, 2011, Boundaries, Dynamics and Construction of Traditions in South Asia. Leela Prasad, 2012, Poetics of Conduct: Oral Narrative and Moral Being in a South Indian Town. Monika Horstmann, Heidi Rika Maria Pauwels, 2009, Patronage and Popularisation, Pilgrimage and Procession. This page was last edited on 13 March 2019, at 00:43 (UTC).